J-M. Basquiat and M. Angelou, Life Doesn't Frighten Me, New York, 1993 (illustrated in color, n. p.). Profit I is generally considered to be one of Basquiat's greatest paintings. Executed in Italy in 1982 at the height of his creative development and fame, this epic canvas can be seen both in its scale and ambition to be his equivalent of Picasso's Guernica. Here Basquiat shows his understanding for the expressionist brushwork of de Kooning and Kline, and the frenetic graphic language of Cy Twombly. He mixes art historical precedent with the raw primitivism of urban graffiti to paint an image of a black crucified hero, that is partly a self-portrait and partly African warrior and Voodoo shaman. Basquiat was born in Brooklyn in 1960 and brought up in Brooklyn amid a mixed ethnic parentage; his father was Haitian and his mother a New York Puerto Rican. He began his intense but short-lived career as a graffiti artist, spray-painting street-wise aphorisms and drawings on subway walls under the tag name of SAMO. His arrival on the art scene was meteoric. By the age of twenty-one, he was being courted by international dealers such as Annina Nosei, Larry Gagosian, Bruno Bischofberger and Emilio Mazzoli. 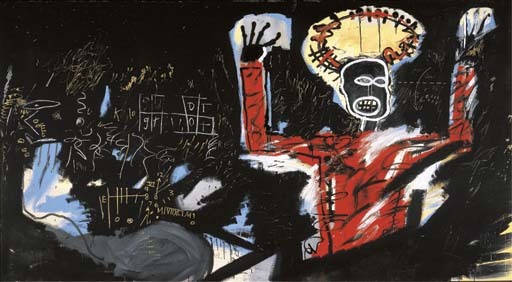 Basquiat held his first one-man show in 1981 at the Galleria d'Arte Emilio Mazzoli in Modena, Italy. It was here a year later that he began work on Profit I and the painting was included in Basquiat's first major exhibition at the Galerie Bruno Bischofberger in Zurich in September 1982. Basquiat's confidence was obviously bolstered by his new-found fame and success, and Profit I is one of his largest canvases attempted to date. Kai Eric, a friend who accompanied Basquiat to Modena, wondered at the time whether the artist could handle something of this scale. "He seemed totally unfazed. He had no preconceived notions of what he was going to do, and then he began painting. The spontaneity was incredible." (as cited in P. Hoban, Basquiat:A Quick Killing in the Art, New York 1998, p. 113). In a famous interview with Henry Geldzaher, Basquiat stated that his main subject matter was "Royalty, heroism and the streets." As the most successful black artist in history, Basquiat was very much conscious of his black identity and his alien place within a white-dominated art world. Though not overtly political in his aspiration, he introduced into his paintings the image of a black protagonist, who is often adorned with a halo or a crown of thorns that lends the figure a superiority, a specialness and religious aura. Sometimes this black hero represented political figures such as Malcolm X, or acclaimed athletes and Jazz musicians like Jesse Owens or Charlie Parker respectively. Often the figure is autobiographical. Profit I is dominated by a skeletal black man who looms enormous out of the darkness like a Voodoo zombie. Influenced by the Art Brut of Jean Dubuffet, Basquiat paints the figure with stick-man simplicity and it is this directness, combined with brash brushwork, which endows the picture with its rawness and immediacy. Above his ghostly face is a crown of thorns that, against the yellow ground, also acts as a halo. His upraised arms allude to a crucifixion or an action of surrender or alarm. Yet the gesture could also be interpreted as an aggressive attack by this bogeyman. Thus Basquiat does not indicate whether the figure is victim or aggressor. If one reads this as a self-portrait, then, the painting becomes a telling indictment of his perception of himself as a black artist. The title of the painting presumably refers to the messianic presence of this specter-like figure. Artists have often seen themselves as seers or prophets, and it is interesting to compare Profit I to Egon Schiele's Prophets (Double Self-Portrait), 1911, where another self-absorbed painter shows himself as a tortured, ghost-like messenger of prophetic vision. Basquiat's spelling of the word Profit alludes to the heady commercialism of the art world in the 1980s, and the role of the artist as a "sell-out". Basquiat had recently begun to reap the enormous rewards of superstar celebrity status, and these excesses and the greed of others that he now experienced would have contrasted greatly with his earlier life as a struggling graffiti artist. Richard Marshall has written that some of Basquiat's most recurring subjects were money, racism and death. Profit I seems to encapsulate all three themes. The African martyr-warrior-demon emerges from the vast blackness, his fiery red shirt seemingly emblazoned with its own heat, and his head a death mask of Halloween white. The sweeping brushwork of the black may owe its origin to the work of Franz Kline, but the mood here is much more ominous. Is he emerging like a phantom from his own hell or infinite dark space? Basquiat animates the enormous surface with spontaneous markings of white as though he was writing graffiti across the heavens. He is influenced here by the scrawl-poetry of Twombly, by the notations of Leonardo and by the wild hieroglyphs of Pollock's early paintings. The scribbles denote an agitated mind where thought is converted to a frenetic handwriting of strange street symbols, mathematical diagrams and anxious doodles. No meaning can easily be discerned and one remains in awe yet confounded as though one has been confronted by the mystery of the universe itself. Fig. 1 Cy Twombly, Study for Presence of a Myth, 1959, lead pencil, oil and colored pencil on canvas, Öffentliche Kunstsammlung Basel, Kunstmuseum.